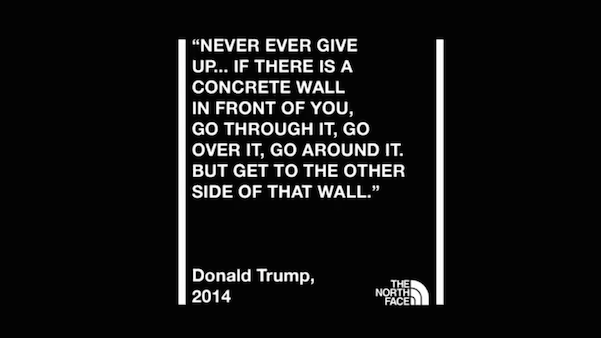 The North Face isn’t standing down against US President Donald Trump’s proposed border wall with Mexico. For its latest ‘Walls Are Meant For Climbing’ campaign, the outdoor product company has issued a series of quotes on overcoming walls by climbers Monserrat Matehuala and Conrad Anker, poet Maya Angelou, and… Trump. The quote that reads, “Never ever give up… If there is a concrete wall in front of you, go through it, go over it, go around it. But get to the other side of that wall,” is from the US leader’s 2004 commencement speech at Staten Island’s Wagner College. The citation was recently resurfaced by The Daily Show in light of the ongoing US government shutdown. As part of the campaign, The North Face has declared its commitment to “building free, public climbing boulders in Atlanta, Brooklyn, Chicago and Denver” as places to unite, instead of divide, people. Meanwhile, Trump held a candlelit fast food feast in the White House for America’s champions of college football, the Clemson Tigers, that has been likened to a scene from the 1994 film Richie Rich, sparked humorous memes and photoshopped edits from witty internet users, and ignited a juicy diss from Burger King.